This month was a quiet month in comparison to June, but it was still pretty great. As you can see in this post - I've loved having time at home and working/chilling. I was able to read a fair amount as well but couldn't remember off the top of my head what specific books I read. I started The Boy Most Likely To by Huntley Fitzpatrick and gave up about a third of the way through - which rarely happens for me. I think the fact that I read it just after A Court of Mist and Fury didn't really help. As you are reading this I am currently either on the plane or in Bulgaria for my summer holiday! Keep an eye on my instagram for some snaps, and my snapchat (christinastorey) but apart from that I won't be posting on the blog as I'm only away for the week. This book. It was just amazing. I had heard so many people rave about who great it was, that I didn't think it would live up to its reputation - but it definitely did! Following straight on from A Court of Thorns and Roses, Feyre is returned to the Spring court but is held by Rhys's promise. Full of so many good twists and development of characters that I was hooked. The main thing in this book was the character development. Being able to see the development of Feyre and the honest side of both Tamlin and Rhys really was different to the first book but worked so well. I loved the Night Court - Sarah J Mas's description and imagery was beautiful, I really imagined in my head lying under the stars like Feyre does. 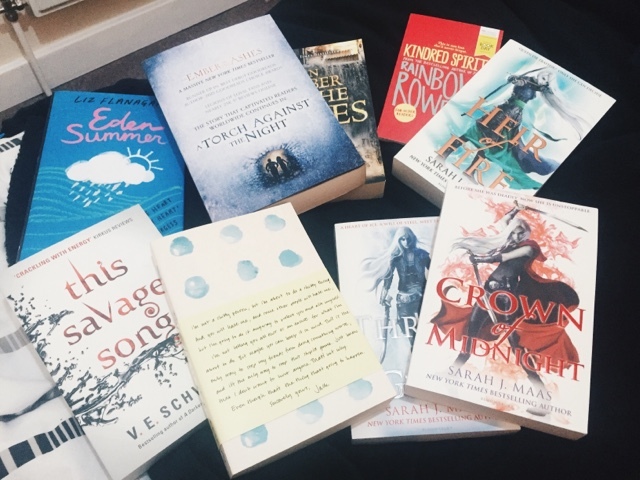 As I said with ACOTAR, I don't read much Fantasy but I was really plesantly surprised and picked up Sarah's Throne of Glass series at YALC because I was so impressed with ACOMAF. One of my favourite things is when my friends text me about what books they're reading, or think I should read - and this is why I picked up this book. My friend Lucy recommended it saying E Lockhart wrote women really well and has a good message - so I was intrigued. And, I loved it. About an ordinary girl who goes to boarding school and how she works her way up the social ladder through her boyfriend and how she realises the exclusiveness of secret societies and unfairness in the world we live in. E Lockhart has such a different and interesting writing style that immediately tugs you in. She was great at building up the exclusive effect of the society and fraternity culture. Overall I just loved the positive equality message Lockhart presents, it got you thinking about life and the power you could have. This YA contemporary novel was an interesting but fun read. About Mallory, a girl who suffered verbal abuse and used silence as a weapon throughout her childhood at a foster home, going to high school for the first time after years of treatment and love from her new foster parents. However she meets someone at high school she never thought she'd see again - Ryder, her only companion through the dark years. I love when contemporary books handle hard subjects, as well as a lovely love story - the theme of abuse and post traumatic stress was present throughout this book and gave a lot of the characters depth. The difference between Mallory and Ryder was perfect and the emotional journey they go on throughout the book was necessary. I really enjoyed reading this book and is one of my favourite YA contemporary's that I've read in a long time. I read this book leading up to YALC, hoping to see the co-authors panel (which I did - and loved). I didn't really know what to expect, but I really enjoyed it. It takes place during San Diego pride week where Mark is in love with his best friend and Kate is about to meet the love of her life. Mark and Kate have sat next to each other in Maths throughout the year but one night they instantly becomes friends. This was such a sweet book about friendship, growing up and coming out. It really made me want to go to a Pride parade and dance around like the world doesn't matter. Told from dual perspectives and two different authors it had such a good rhythm between the characters and hearing both David and Nina chatting about the book at YALC made it even more special. This was an interesting read - I mostly read this because there was a chance I would be interviewing Claire Hennessey on the second day of YALC, although that didn't happen I'm still very glad I read this book. Spoken from the perspective of Annabel, who is dead - but has one more task before she dies fully - to try and fix Julia, a fat old classmate. Annabel didn't believe she was sick, and still doesn't - but she died from anorexia so it was a really interesting perspective to read the novel. We travelled through Julia's school year and followed her ups and downs as Annabel tried to help her, but failed in some aspects. This book had some interesting characters and a really sensitive message to get across, I didn't particularly love reading it, but I'm glad I did. This month I read a lot of good books, and I'm so excited for the books I'll be reading at the beginning of August as I'm tackling most of the books I picked up at YALC - plus I'm on holiday - so I'll be reading at lightening speed! Although I know when I return I need to start on uni reading which will be interesting to return to, but I'm excited to start my new modules so it's all good! you get through so many books! this is a habit that i really want to get back into as i used to do it so often but don't anymore :( the problem with forever sounds really interesting!